» Loop Surveys Review – Can You Make Quick Cash? Loop Surveys Review – Can You Make Quick Cash? Welcome to my Loop Surveys Review where I'll be taking you through everything you need to know about this relatively new survey panel. From first glance they do seem to be good paying survey panel, but there are aspects to the site you should know about if you are considering joining. Some of which are a concern! Anyway in this review I'll be telling you if Loop Surveys is a scam or are they like I said a panel that pays out well. Loop surveys is a US based survey panel owned by a market research company called Logit Group. They are a fairly new site only just coming onto the survey scene last year. This is a panel that it is targeted towards north america, mainly USA and Canada and aims to pay residents of those countries for their opinions on different topics in various surveys. This is the same concept with most survey sites out there as there are many companies out there looking to develop and improve their products and services and need the help of consumers to do so. The same goes for the companies that Loop Surveys work with. Being a member of the panel you will recieve invites to surveys these will be coming in through your email and also some can be found from your dashboard when you login to the site. For every survey you complete you will recieve a certain amount of cash for it. Most of the time you will receive between $1 and $2, these can also take between 10 and 60 minutes to complete. It all depends on many factors for the worth of the survey such as topic, time and the specific demographic they are trying to reach. One thing to be wary and don't be disheartened if it happens to you is that you will get disqualified from surveys, that's just how this business is. If you are disqualified its probably because you are either not a good fit for the survey or they have reached thier quota (In other words got all the responces they need so no longer need anymore people for that survey). You will find that all this goes for Loop Surveys aswell, and from looking at the reviews it seems to be an issue for many members using the site. Surveys are the main way to make money but you can also get paid to refer friends to the panel which in my opinion could be the best way to play it. Referral Programs are one of the best ways to make money on survey sites as they can help you make a passive income each month without you really needing to do anything. With Loop Surveys you will receive $1 per member you invite which is awesome as there is potential with this and you could reach the minimum threshold potentially more easily than just filling out the surveys. You will only need to refer 25 friends in order to get paid. If you are unsure on how to get referrals to sign up for survey sites then check out this useful guide I created or instead check out the #1 Recommendation I use to refer the main share of my referrals to survey sites. You can get paid via Pre-Paid Visa cards however you will need a minimum of $25 in order to request a payment. They do have an efficient payment system which is good so this means you can expect to get your reward within 24 hours of request. 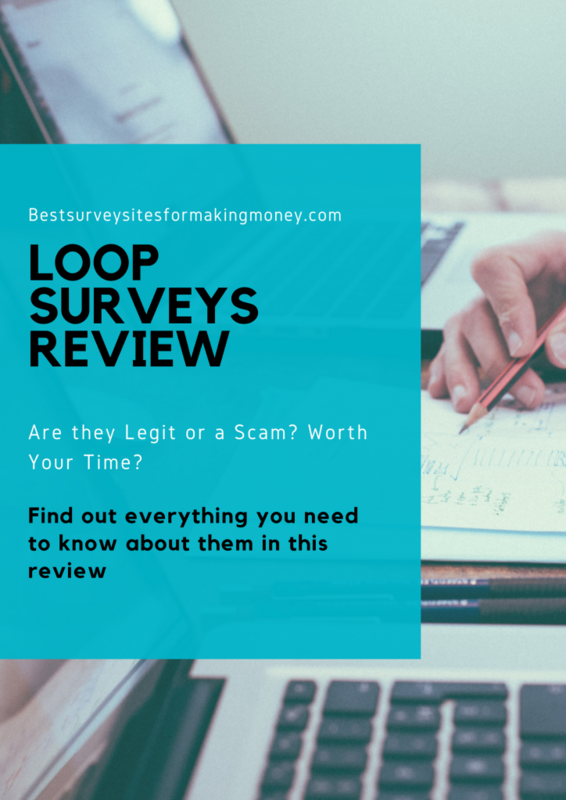 One concern is the amount of negative reviews with the company, while this isn't too do with them paying out as Loop Surveys is legit however alot of people are complaing with how hard it is to get paid. This is of course another concern I see with Loop Surveys in that the earning potential is low. While you can make money with the referral program they have not every one who signs up will be interested in that. Most people will be signing up because they have offered opportunities to be paid for their time in surveys however making a good amount doing surveys seems to look quite difficult. At $25 I would consider that amount to be way to high as there aren't a whole lot of opportunities avialable to you. With the limited surveys and especially since I have found that surveys are hard to qualify for it may take you a lot of time to reach that threshold. I don't tend to use any survey sites that have thresholds over $10+ because 9 times out of 10 you will just end up giving up way before your even half way there. Some good examples of okay survey sites with high thresholds consist of Vindale Research and Cashcrate who have $50 and $30 minimums respectively. Loop Surveys is legit and they do have a history of paying out there members on time. Although whether this site would work for you depends on two factors, if you are looking to complete surveys and get paid well for your time I would say no and not recommend them as making money with surveys is slow. However if you are instead looking at making money with the referral program I would recommend them as you can make a good solid income if you know how to utilise it. Previous Post Giftloop App Review – Make Easy Money While Charging Your Phone? Next Post Earning Station Review – Is Earning Station Legit Or A Scam?